I'm not one for accents; I can't do them, and I'm not even very good at identifying them. I am, however, one for brogues of the pedestrious variety, and as fortune might have it I actually bought myself a new pair last week (I say a new pair, but they're actually an old pair, as vintage is so in, darling). At the time of purchase, however, I had no idea that brogues are Irish, and it was only upon reading brogue in the OED that I made the connection - and to think some people doubt the value of reading a dictionary! Regardless of my inability to recreate one, however, I do admire a melodic Irish brogue. Of the vocal sort, there is some mystery as to its etymology - it has been suggested that someone was said to speak with a brogue if they used the word bróg for shoe (or, in other words, if they spoke Irish). There is even a discredited story that a brogue was said to be spoken by those that had a shoe in their mouth. Piffle and poppycock, I say! If you're unfamiliar with an Irish brogue, have a listen to the actor Chris O'Dowd, who is from Douglas, Cork, and tell me that it's not the most wonderful accent that you've ever heard. 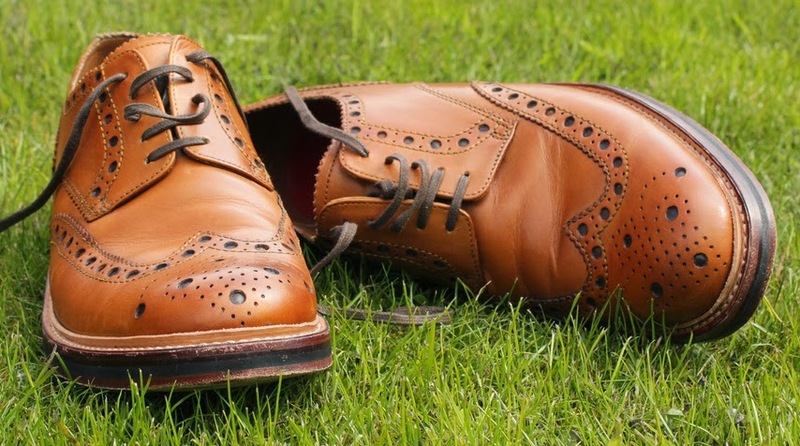 Do you own a pair of brogues? Do you like an Irish brogue? Do leave your most lilting comments in the box below. At the (un)request of fellow bloggerer Kara Braun, I've included a video of Celtic Thunder. If you listen really closely, you can just detect the faintest of Irish brogues in their singing. Several decades on this planet have revealed to me an interesting but strangely little known truth. It's not that difficult for an Irish person to do an English accent, beit Yorkshire, Cornwall, Liverpool, London or even the coolest one, Geordie, but it is absolutely, completely and utterly impossible for an English person to do an Irish accent. I'll bet you can't find a YouTube video to prove otherwise. That's because, I can assure you as a London-born brogue-wearer living in the west of Ireland, it is not recommended, for historical reasons, that an English person even ATTEMPT to do an Irish accent, unless they see it as somewhat advantageous to have teeth that are rather more portable than usual. Well, A.N, I actually think the inverse is true. Yes, most people can't do Irish accents (apart from the Irish) - they can do some sort of profane caricature of an Irish accent, but they can't actually *do* one. However, I've never met an Irish person that can do an English accent - and certainly not mine. I have a middle-England, rather vague "from the south but not from the farmer south" accent, and (although many have tried), I've never met one person that can do it. All they can attempt is an affectedly posh, over-enunciated effort. That's not how I sound. It's definitely not. No, no, no. .....oh sorry, you said don't. There you go, Kara - I've included a Celtic Thunder video so that you can get started. Thank you for this, Kara! And, for the record, this is exactly what it's like to visit Ireland. Accent or no accent. Oh my, you didn't haha. There is only so much a girl can take! Last year, I was able to see them in concert - I am not exaggerating when I say it was a small piece of heaven. Now, if only I could afford to actually visit Ireland. I sometimes think I'm really good at maths after I've been drinking, which might be true, as I've never been independently tested. Brogues are Irish? That IS interesting. I would have thought a pair of Brogues, Loake's say, were quintessentially English. I'm am quite relieved to hear they're not Welsh though. There's only so much the empire can take. It rather is, isn't it? Well, they trace their roots to Scotland and Ireland. Those dastardly English! Always trying to make everything "quintessentially" theirs; even a style of shoe which has retained its Irish language name. The cheek of it! Chris O'Dowd is actually a man of the West, from Boyle, Co Roscommon. Burnsides - Or Sideburns? Or Sideboards? Bumf - "Strong, Thick and Thoroughly Absorbent"